The Whitehaven Hayridge apron-front kitchen sink features the benefits of the Whitehaven with a gentle pattern of horizontal ridges on the apron-front. The Self-Trimming(R) design requires only a simple rough cut, overlapping the cabinet face for beautiful results. The sink is designed to fit in most standard 36-inch apron-front cabinetry. A low barrier divides the two compartments, making it easy to wash and rinse large items while still keeping the two basins separate. Crafted from enameled cast iron, this sink resists chipping, cracking, or burning for years of beauty and reliable performance. Textured ridge design on apron-front. 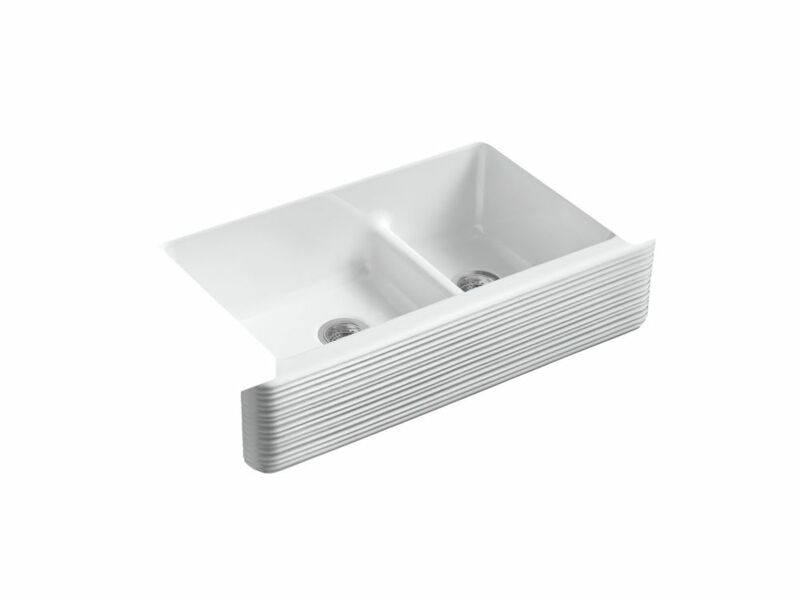 Whitehaven Undermount Cast Iron 35.6875 inch 0-Hole Double Bowl Kitchen Sink In White The Whitehaven Hayridge apron-front kitchen sink features the benefits of the Whitehaven with a gentle pattern of horizontal ridges on the apron-front. The Self-Trimming(R) design requires only a simple rough cut, overlapping the cabinet face for beautiful results. The sink is designed to fit in most standard 36-inch apron-front cabinetry. A low barrier divides the two compartments, making it easy to wash and rinse large items while still keeping the two basins separate. Crafted from enameled cast iron, this sink resists chipping, cracking, or burning for years of beauty and reliable performance. Whitehaven Undermount Cast Iron 35.6875 inch 0-Hole Double Bowl Kitchen Sink In White is rated 5.0 out of 5 by 2.